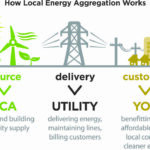 On Saturday, June 4, a first-ever public meeting was held with the Los Angeles Department of Water & Power Commissioners, General Manager Ron Nichols and the Energy & Environment Committee of the L.A. City Council. 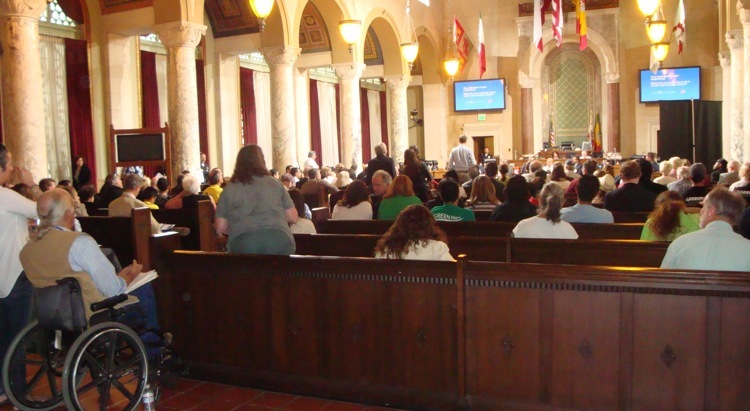 What made this meeting ground-breaking was that it included the public in a discussion of LADWP’s Integrated Resources Plan (IRP) and possible rate hikes associated with the Plan. A coalition of faith and environmental supporters turned out for a rally before-hand. An impressive number of supporters were from the Sierra Club and Greenpeace. Rev. Bob Shore-Goss from MCC in the Valley spoke at both the rally and hearing. Rev. 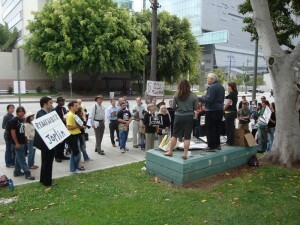 Dr. Bob Shore-Goss, Pastor of MCC in the Valley, North Hollywood, spoke both at the rally and meeting. 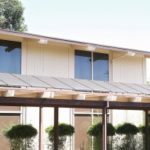 He brought up a sense of urgency in terms of human-induced climate change and its on-going effects globally, and DWP’s difficult process with commercial solar. In the meeting itself, some 60 persons came to the podium to offer public comments. The overall message of the day: LADWP needs to commit to being coal-free by 2020. 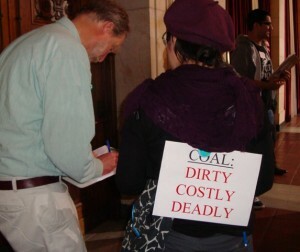 There were variations on this theme: coal is the most expensive energy; L.A. is powering its city at the cost of public health and livelihood of folks in Utah and Arizona; the actions of LADWP, the largest public owned utility in the nation, must be guided by their ratepayers; it is irresponsible to stay dependent on a dirty source when renewable energy is available now; and L.A. has the opportunity to be a leader in national utility standards. 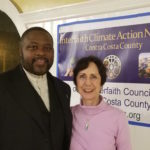 In her comments, Southern California Outreach Director Allis Druffel brought a message from Interfaith Power & Light Utah Director Stephen Trimble. Because of LADWP’s planned use of coal from Utah’s Intermountain Power Project until 2027, 200 Utah residents will continue to die each year. Two million Utah citizens who live in the vicinity of IPP will continue to suffer from some of the worst air quality in the nation with its accompanying health effects. A poignant statement was given by 10-year-old Darrio, a student of the Los Angeles Unified School District and member of Coalition for Educational Justice. He urged the city leaders to go coal-free by 2020, citing the scientific evidence between global warming and extreme weather events such as tornadoes. 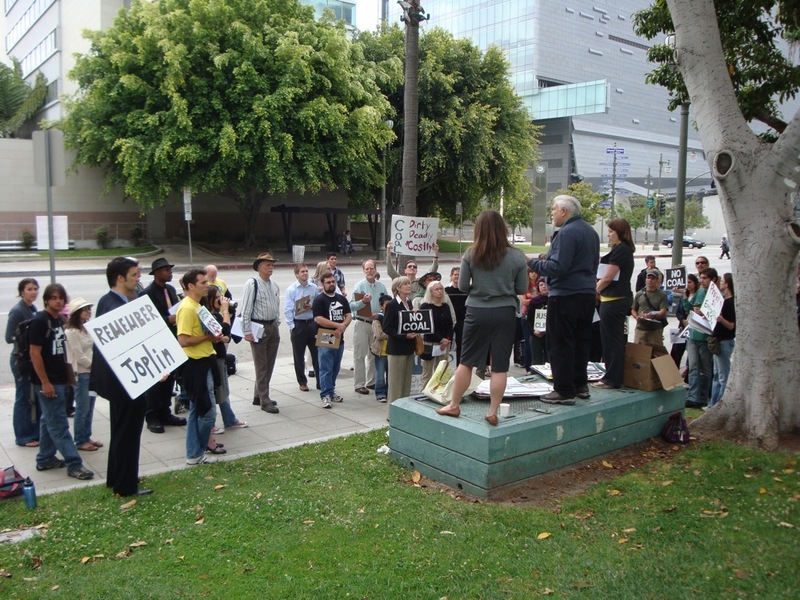 Add your voice in urging the LADWP to be coal-free by contacting the members of L.A. City Council’s Energy & Environment committee: Jan Perry, Chair, (District 9) – (213) 473-7009; Tony Cardenas, (District Eight) – (213) 473-7006; Richard Alarcon (District 7) – (213) 473-7007; Paul Koretz (District 5) – (213) 473-7005; and Paul Krekorian (District 2) – (213) 473-7002. 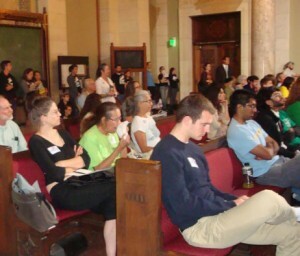 Concerned citizens urged LADWP and L.A. City Council members to act with a sense of urgency.